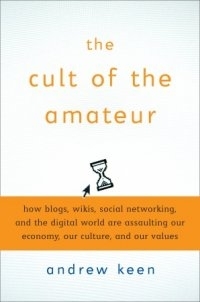 I’ve just finished reading Andrew Keen’s The Cult Of The Amateur, a book I’ve referred to before in some of my arguments defending the Blooker prize, and in my commentary on the quality of blooks in general. In it he talks about how today’s Internet, with its focus on user/amateur generated content, is destroying our economy, demeaning our values, and degrading our culture. It’s a big let down, overall: Keen starts with what looks to be a convincing argument against the amateur, but he shoots himself in the foot with the extreme stance he takes on the Internet. 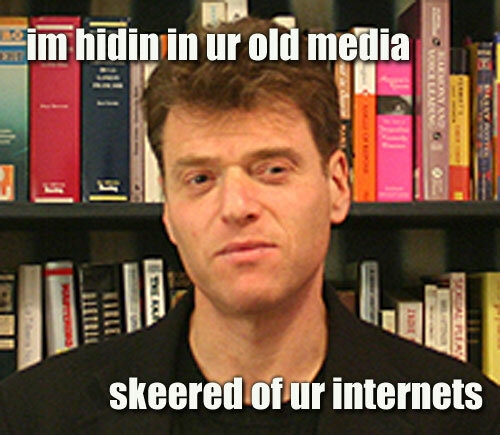 His arguments would be easier to take seriously if he didn’t go on and on and on about how the Internet is completely bad. Keen says we will have to filter through the dross to get to the real gems as more substandard content is produced online. The irony here is that I’m filtering through the dross in his book, to get to the relevant points that I can talk about. Alright – first off, Keen refers constantly to a New York Times “manifesto”, in which Kevin Kelly, one of the founding editors of Wired magazine, writes about his dream of a liquid library. … once digitized, books can be unraveled into single pages or be reduced further, into snippets of a page. These snippets will be remixed into reordered books and virtual bookshelves. Just as the music audience now juggles and reorders songs into new albums (or “playlists,” as they are called in iTunes), the universal library will encourage the creation of virtual “bookshelves” — a collection of texts, some as short as a paragraph, others as long as entire books, that form a library shelf’s worth of specialized information. Kelly’s views are radical: in his vision of a liquid library all books will be digitized to make the World’s Only Book, and individual writing would be freely distributed online. Writers will no longer receive royalties from their creative work, and would earn from speeches and selling add-ons to make a living. So, booksellers, defend your lonely forts. Keep your edges dry. Your edges are our edges. For some of us, books are intrinsic to our sense of personal identity. Updike’s reaction is an interesting read, though some point out his arguments are the rantings of an old man resisting change. Personally I’m vouching for the ‘old man’, mostly because I can’t bear imagining a world without bookstores; without places to relax and mingle and read. And I also believe that royalties are one of the best ways to spur a writer to keep on writing, creating, and producing quality content. The second point of worth that Keen has brought up is that of the amateur in writing. He alleges that the Internet allows amateurs to publish their work … too easily, in fact. Blurb and Lulu are really just cheaper, more accessible versions of vanity presses, where the untalented go to purchase the veneer of publication. According to John Sutherland, chairman of the 2005 Man Booker Prize committee: “It would take approximately 163 lifetimes to read all the fiction available, at the click of the mouse, from Amazon.com.” And these are just the professionally selected, edited, and published novels. Do we really need to wade through the tidal wave of amateurish work of authors who have never been professionally selected for publication? These comments stink of elitism. But while they provoke an instant defensive reaction (one that I will be more than happy to provide) I have to say there is a shred of truth in it. There have always been amateur writers (heck, I consider myself one) who are still learning the ropes of the craft, who are working on their writing, and who are trying their best to land their first big break. Before this amateur writing consisted of submitting content to magazines, and either getting rejected by editors (and improving in the process) or getting published. Either way writers are being vetted by ‘professionals’, people who force us to get better as we write. Now with the Internet we don’t have this minimum bar. We don’t have editors, and we don’t have professionals vetting the minimum quality of content. Lulu publishes anything for a fee, and blogs are used to publish (of a sort) anything for nothing. So what does this all mean? It means many things. One is that readers might get daunted and stay clear from Internet fiction. The other is that we will have to filter through the dross ourselves, since we have no editors to do that for us. But I think the concept that I like the most is that of a middle line … publications like The Friday Project showcase the best of both worlds: of editing, and of Internet content. Whatever may come of this situation is hard to tell. But what I’m convinced of is the possible quality of writing on the net. I’ve found Methuselah’s Daughter to be a highly rewarding read, and blooks like Undead Flowers and Mortal Ghost to be very entertaining. The coming years will be interesting ones. We’ll just need better filters, that’s all. Filters Are Elitist … So What?